If you’re looking for air cleaners for any environment, whether industrial, commercial, restaurant, healthcare or the home, we have an air cleaning solution for you. Commercial Air Cleaners for Cigarette Smoke, Kitchen Exhaust, Mold, Pollen, Allergens and much more! Find Industrial air cleaners for Coolant Mist, Welding Fumes (including hexavalent chromium), Grinding Dust, Plasma Cutting, Laser Cutting, Injection Molding, EDM Smoke and other industrial contaminants. If you have a need for a system to clean air in your home or workplace, we have a product to do the job. Invest in an air purification system from Air Quality Engineering — It’s a Smart Idea. When comparing air filtration systems, remember that Air Quality Engineering gives you the best dollar value in the business. Our systems provide the optimal balance of overall quality and intelligent design. Each product we sell is simply good, solid equipment that performs year after year. Air Quality Engineering products maximize efficiency, airflow and filter area to provide the cleanest working environment, longest service intervals and lowest maintenance costs per dollar spent. We strive to MAXIMIZE YOUR RETURN ON INVESTMENT. When you call us a real, live, knowledgeable human being will take your call. Whether you know exactly what kind of air cleaner you need or have no idea, our team of air purification specialists will provide prompt, useful solutions to your problems. Our hours are between 8:00 AM and 4:30 PM central time. Air Quality Engineering manufactures a wide variety of air cleaners and air filtration systems for industrial and commercial applications. 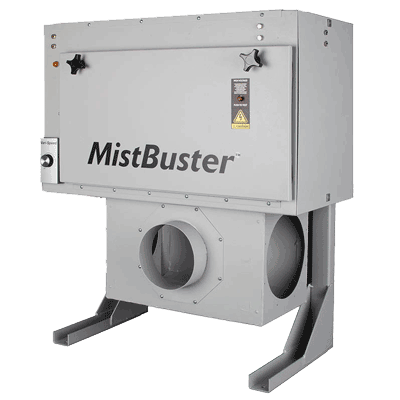 Our product line includes mist collectors, welding fume extraction systems, soldering fume extraction systems, electronic air cleaners (electrostatic precipitators), HEPA air cleaners, cartridge dust collectors and disposable media filtered air cleaning systems. We also provide portable and overhead systems, as well as ducted (in-duct) systems for a multitude of environments, including oil and mist collection in industrial applications, welding fume, tobacco smoke removal in the hospitality industry, and air purification in healthcare fields. In addition, we produce HEPA and electrostatic home air purifiers that have been repeatedly ranked #1 in consumer magazines. Air Quality Engineering was organized as SmokeMaster in 1969, emphasizing the design, development and sale of air cleaners, specifically for removal of tobacco smoke in commercial applications. In 1974 we began our relationship with Honeywell, a major manufacturer, when we agreed to produce commercial electronic air cleaners for them – an agreement that would last 10 years. Shortly thereafter, we also began designing and producing Honeywell’s industrial electrostatic precipitators. This line later grew to include disposable mechanical filter systems. Honeywell’s subsequent decision to manufacture their own brand of commercial air cleaners provided Air Quality Engineering with the opportunity to develop our own worldwide market. Simultaneously, we purchased Honeywell’s industrial air cleaner business and became a major supplier of industrial air filtration systems, mist collectors and cigarette smoke removal systems. At this time it was clear that a new and more comprehensive name would better reflect our broader range of systems, and we became Air Quality Engineering in 1983. Our experience and commitment to air purification has brought us to where we are today – manufacturing complete air filtration systems & industrial air filtration products that provide the best performance, efficiency and capacity for the money. Our indoor air quality experience has led to the unique Coanda airflow pattern which increases the performance of the products as well as improves heat distribution within your environment. Our patented variable voltage technology increases air filtration efficiency and our variable speed controls fit the demands of the moment. All air cleaners are made here in our Minnesota headquarters. Our mission is to serve our customers by designing, manufacturing and marketing the most cost-effective, high-quality air cleaners and filtration systems in the indoor air quality industry. We continue to operate on the basis of providing practical, productive air filtration systems and honest answers, in the belief that delivering on our promises is our most effective sales tool. Call (888) 883-3273.